Example of Maritronics installed Raymarine Radome radar on a mount by Seaview. The anchor light is built in to the mount for a professional look. The antenna gets the optimum view of weak targets because it is not partially obstructed by bimini top. The angle is also set slightly forward for the best reception. 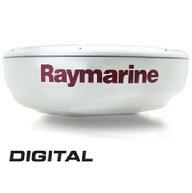 RaymarineRD424D 24" Digital Radome 48nm range 4KW Radar antenna with interconnect cable.